Bailing out of our coastal route from the Bay of Plenty to Poverty and then Hawks Bays and instead turning inland to Rotorua was the great decision we hoped it would be. It was heartbreaking to cancel 8 nights of reservations and to begin the process of securing lodging for those same nights in a new direction, but our sense of safety on the road into Rotorua and out several days later was vastly higher than it had been on the coastal route. There seemed to be fewer truck-trailer rigs and perhaps their traffic lanes were a little wider. Piles of abandoned clothes & packs signaled nearby hot springs. Whatever the cause, we no longer felt such stiff competition for our narrow strip of asphalt as we headed for Rotorua. The weather did turn cooler as expected, but the only downpour came after we were in for the evening. And Rotorua offered more to delve into than the pleasant though not too varied roadside views near, but often not in sight of, the coastline. When Bill added up our week's elevation gain it totaled 13,000'--close to what we often do in the Alps--all the more reason for a little break in the riding routine. Entering the geologically active area was immediately evident as most of the budget motels advertised their onsite, hot mineral baths and occasional blasts of hydrogen sulfide insulted our nasal passages as we walked around town. Visually following the length of some metal posts to their tops revealed not the expected street light but a steamy vent for additional hydrogen sulfide-laced fumes. A stop in at tourist info informed us that a biking event in a few days at our next destination of Taupo would be extending our stay in Rotorua as their was no lodging available in Taupo. The event was so big that apparently even all of the regional public transportation was booked for most of the next 4 days, so we settled in to see what Rotorua was about. Our guide book warned that some find Rotorua overly commercial, but our first impressions were quite favorable. At 76,000 people, it had enough of its own momentum to withstand the press of tourism and it didn't seem tarnished by the trade. Shops weren't bulging onto the sidewalks with tacky souvenirs though there was an abundance of lodging establishments and eateries. But we slowly found a cynicism creeping into our private conversations about the institutionalized milking of tourists. 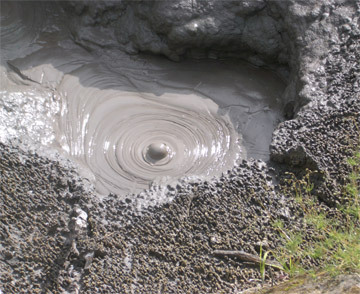 One of the few Rotorua mud pots to be viewed at no charge. It seemed that there was a charge to do everything of interest. At geothermal areas, we are accustomed to taking in the startling sights for the price of getting to the area, but not so in Rotorua. All of the best natural phenomena for miles and miles were behind tall fences, usually with about a $25NZ entrance fee or about $16-17US. Mud pots, geysers, mineral pools and all of the fun and amazing things to see, feel, and smell were on a pay-as-you-go (over and over again) basis. Miffed, we declined to pay, presumably having seen bigger expanses of such things in Yellowstone Park and in Iceland. We did wander through what was left open for the public to view for free in a city park, which were primarily tame steaming ponds of hot water. Not only did all of the showy geological sites carry a price tag, but we soon discovered that the standard fare in Rotorua was always some multiple of the magic $25NZ. Viewing trout from an underwater vantage point was about $25NZ, as was seeing a live kiwi bird or touring a local winery. Even milling around penned sheep and seeing a sheep shearing and sheep dog demonstrations was about $25NZ. Visiting Maori workshops to see and buy wares was, what-do-you-know, about $25NZ. Elsewhere in the world, these are the kind of activities that you expect to do for free, knowing that the operators either hope to sell some products or write it off as a public education expense. Not so in Rotorua, and soon we began labeling this modern phenomena as "Maori Inc." because it coincided with the increased Maori presence. In our first days in New Zealand we were educated about the "fencibles," the pensioned British military men who came to New Zealand from 1847 to 1852 on the heels of the missionaries as the first mass immigrants to settle and defend the Auckland area from. A few weeks later we were dumbfounded to learn that the first tourism visits to New Zealand were at about the same time--in the early 1850's--to Rotorua. Local wars between the Maori tribes and with the Crown dampened the industry during the 1860's, but by the early 1870's it was again actively promoted. A succession of stunning terraced pools of pink and white silica filled with hot mineral water was the big draw. The hot mineral springs and bubbly mud pots were touted for their treatment effects and marketing "the cures" to Europe's wealthy was quickly underway. Souvenir ceramic dishes, thimbles, and cups were manufactured in Europe to complete the tourism package, even in the 1800's. The untimely and massive eruption of nearby Mt Tarawera in 1886 was another setback to the burgeoning industry, destroying the hotel and the picturesque terraced pools, but the resilient business sprung back. And it wasn't just the Europeans that were making the fast buck, as the local Maori quickly learned to cash in on the craze. The first few tourists got by without paying at every turn, but it wasn't long and the Maori were charging about half the price of a night's lodging at a nearby hotel for access fees to panoramas or for the privilege of making a sketch or taking a photo. Boat rides and dancing demonstrations were also included in the fee list presented to hardy Victorian adventurers. So even in our cynicism we had to laugh: the modern "Maori Inc." we felt victimized by as tourists was historically authentic for Rotorua. 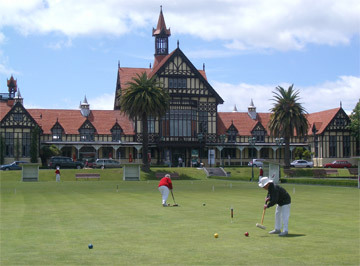 The early 20th century spa building--now a backdrop to croquet. But like modern development projects, these early tourist areas had their set backs. A grand spa house was built right in downtown Rotorua in the early 1900's to capitalize on the tourist business and quickly became a construction project house of horrors. Within days of opening, the white painted furniture was turning black as the lead in the paint reacted with the hydrogen sulfide gases emitted from the healing waters. The high acidity and mineral content of the water almost as rapidly corroded the pipes and fittings that transferred water in and out of the dozens of private soaking rooms. The high humidity within the building rapidly rotted the wooden structure and over the years, collapsing roofs and falling plaster created serious hazards to employees and guests alike. The most amazing thing was that they somehow managed to hold the whole structure together until the 1960's when the building was finally abandoned as a hydro-treatment center and now houses the local museum. 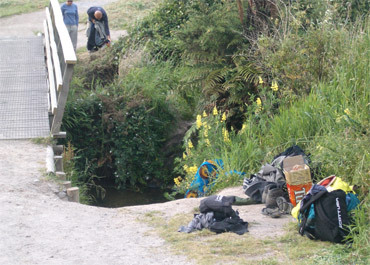 The poorest return on our tourism dollar was trekking out to the Buried Village 10 miles from Rotorua. Our guide book touted it as "the Southern Hemisphere's Pompeii" but were sadly disappointed. Italy's Pompeii was cheaper and truly a dazzling day of seeing the excavated remains of a Roman city--a site we happily revisited a second day. In contrast, Te Wairoa was a real yawner: seeing a few late 19th century dishes and household items retrieved from the volcanic mud and knowing where a few buildings once stood just didn't compare with Pompeii. Yes, the grounds were pretty and they did a good job telling the story of the 1886 eruption, but as a historical site to visit it came up short. Though there was again a certain irony in being modern tourists looking at the ruins of the first tourist establishment in New Zealand. 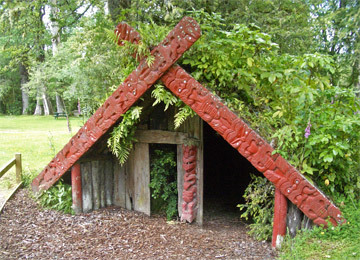 A recreated Maori "whare" (house) at the Buried Village. Expecting to feel ripped-off, we declined one of the big draws in Rotorua, the Maori dinner/dance shows that pack in the tour buses and independent travelers alike. The Maori evenings will set you back $60US or more per person and part of the entertainment at many shows involves bringing audience members onto the stage. We had paid the extra fee to see a brief bit of Maori dancing and entertainment at Auckland's museum and felt it was a sufficient sampler. The hostess there had commented that the Maoris' now include guitar accompaniment and have made other modifications to interest their youth in the old culture and we assumed that many more aberrations were made to create even greater popular appeal at the dinner shows. The caving ladder we climbed..
Our skepticism grew by the day and we found ourselves sneering at the local greenstone carved into pendants with $500 price tags. We didn't for a moment believe they were any thing other than mass produced despite the velvet on the display shelves. We'd noticed in food and clothing stores in New Zealand that the labeling requirements as to the origin of goods wasn't in the same league as in the US or the EU, as items often only said "Packaged in New Zealand" or "Marketed By...." That left us wondering how many of the items that one would assume were Maori crafts based on the presentation were actually overpriced imports. We had no intention of buying, so didn't pursue the matter with the shop keepers, but we considered it a bad sign that so much skepticism had been triggered in us in just a couple of days. In addition to continuing its history of aggressive pricing in the travel business, modern Rotorua has remained true to its heritage in continuing to be a trendsetter in the New Zealand tourism industry. It offers a creative range of activities, from the geothermal sites and Maori heritage events from their first days in the business to the newer inventions of the "adrenaline sports." It's those activities that now makes it a Mecca for those with a youthful disregard for their mortality, regardless of their age. One local I quizzed said the kids swarm in from all over New Zealand, all over the Continent and from everywhere else for a chance at Rotorua thrills. Here, your adrenaline rush could be stimulated by a140' bungee jump, riding in a partially water filled "zorb" ball down a slope, skydiving, jet boating, simulated skydiving on a blasting column of wind, the "swoop" in which 3 people in a pouch are swung at speeds up to 80mph.and other events that someone stayed up too late inventing. These activities broke out of the Maori Inc. $25NZ fee scheme and went for more like $30-$60US a pop. And of course, you didn't have to look far for activities lasting a couple of hours that ran several hundred dollars, like skydiving. We spoke with 1 American man about our age who tried the zorb ball and was unimpressed. We settled for a tamer and more traditional physical diversion by spending an afternoon at the city's indoor climbing wall. It came in a little under the magic $25NZ fee per person and gave us a chance to see our second climbing gym, having visited the one in Portland in October. We welcomed the opportunity to both use different equipment and to see a variation in the climbing gym culture. Our big adventure at the rock gym was climbing up about a 50' high swinging caving ladder suspended from the ceiling. We quickly learned the trick to it was to stretch one's arms and body out to the max, thereby keeping your rear end in towards the ladder as much as possible and dramatically reducing the demands on arm strength. It was unwelcome to have both our penny-pinching and cynicism triggered as it was in Rotorua, but it did spare us one phenomenal disappointment. Mention of Maori rock carvings brought to mind the thousands and tens of thousands of years old carvings we'd seen in Europe and instantly piqued our interest. Looking more closely at the details before we paid, Bill discovered that the Maori rock carvings were from the 1970's--no doubt manufactured specifically for the tourism dollar. Trekking across the bottom of the Mt. 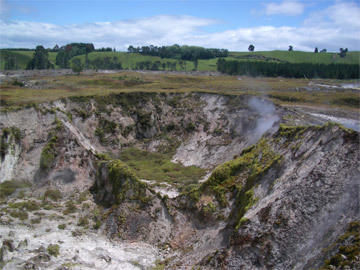 Tarawera crater. The aggressive pricing structures for tourist activities was making us reluctant to spend, but we decided to buy-up, hoping for a more satisfying experience by visiting the locally famous volcano. There was no escaping the Maori Inc. racket however and visiting the remains of the volcano that exploded in 1886 was an expensive undertaking. It seemed like the tourists of the world were damned for eternity to pay and pay again for the European intrusions into the Maori culture and the devastation to their way of life and visiting the volcano was no exception. 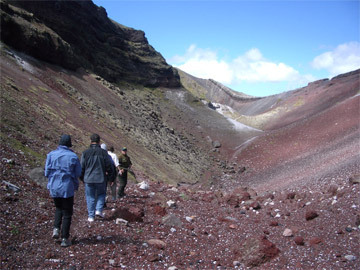 The mountain and crater are now controlled by the Maori and so hikers can no longer amble in on their own. You either pay the big-bucks to fly over it or pay for a half day tour to arrive by a 4WD vehicle with a group for the privilege of a 40 minute walk in the crater. It was $121NZ ($82US) each for the opportunity to make the short trek. You'd have thought that at that price that the 1 page brochure about the explosion was included, but no, it was another $6NZ--we just skimmed the info sheet and set it down. But the short walk down into the crater was as interesting as we hoped it would be. Other active volcanoes that we've visited, like Mt St Helens that blew her top in the 1980's in our neck of the woods and Mt Vesuvius that buried Pompeii, must be viewed from the rim, so walking to the bottom of this crater was a novelty for us. We were glad for our summer experience in the Dolomites where we learned how to scurry down a steep scree slope safely, so were able to approach it with more confidence than the other 6 members of our tour group. Being right in the geology and feeling it under your feet (and even inside your boots) does make the technical points of the geology more interesting. 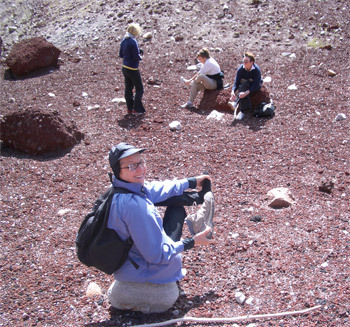 Dumping the Mt Tarawera scree from our boots.. The Mt Tarawera volcano was a cluster of 11 white silica rhyolite domes, domes that were slow accumulations of multiple oozing rhyolite events that gently flowed out instead of blowing out. In 1886, things changed and a deep basalt flow surged up from the depths, mixed with the extensive natural water system, and the hot frothy brew shot straight up almost 7 miles and came down as red or black, bubbly looking scoria chunks. There was no lava flow with the basaltic eruption, only the local crumbly looking scoria and deep mud for miles beyond the immediate blast site. We were told it was a basaltic Plinian eruption--the most explosive type there is. It's the same general category of eruption, of the 6 general types, as Mt St Helens in Washington State and Mt Vesuvius in Italy. The 5 hour Mt Tarawera eruption in 1886 also created an impressive, 10 mile long fissure that is still visible. We easily filled our 3 days in Rotorua and the series of new motel reservations on the road south dictated that we be on our way. Despite being offended by and disappointed at the aggressive pricing structure for sightseeing in Rotorua, we enjoyed our stay. New Zealand's countryside is green and pretty but having more to contemplate and do was a welcome change of pace in one of the big tourist hubs of New Zealand. And Rotorua was just the first stop in a short series that would have us delving into the volcanic history of the islands in greater depth. Next would be the site of an even larger eruption that formed Lake Taupo 26,000 years ago, and then we'd be doing a much touted full day hike called The Tongariro Crossing between volcanic peaks in a national park. We felt lucky that both of those were still in our plans as it was at Rotorua that we spoke with yet another German cyclotourist that was hopping on a bus with his bike and trailer out of frustration. The young German cyclist had also biked from Auckland and was discouraged about the traffic. Local cyclists had told him that the traffic conditions from Rotorua south to Taupo where we were also heading were difficult and so he was taking a bus to Wellington. His 5 week vacation didn't allow him the time he needed to wait out the lodging problems caused by the annual Taupo bike race, so he was reluctantly bypassing the entire area. Dashed also were his plans to do The Crossing. We weren't pleased with his report about the worsening traffic south, but decided to stay on course. Fortunately, the advise we received earlier from a non-cyclist proved to be better--that indeed this wasn't the main commercial route and it was more pleasant than what we had ridden farther north. And unlike the German cyclist, we had the time in our schedule to tread water in Rotorua while the congestion cleared in Taupo. A one-third segment of a portable war canoe from the 1820's. The Auckland Museum had introduced us the history of the Maori and our visit to Rotorua gave us first hand experience with their relationship to tourists, both current and in the past. We were left confused and longing to better understand what was going on with this uneasy collision of cultures in New Zealand. One of the first startling realizations was that though the Maori society was primarily an ancient Stone Age culture when the Europeans arrived in the 1800's, the relics of their culture weren't ancient. Our travels have made us look for "the zeros" on exhibits: "Are the items displayed thousands or tens of thousands of years old?" But that's not the case with this Pre-Industrial society of the Maoris where 150 years is about the limit of antiquity. Many of the traditional Oceania boats we saw in Auckland's Maritime Museum weren't hundreds of years old but were built in the 1970's by craftsmen using traditional methods. 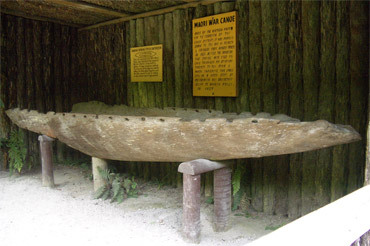 We did see a few older craft, like the canoe in Rotorua from the 1820's that was built in segments for transporting over land for a battle on a lake, but they were the exception. As with the boats, little of the Maori artifacts that we saw dated before the mid-1800's. Presumably that abundance of material from the 1800's is because of the arrival of the Europeans who were busy collecting and documenting what they saw, creating a snap shot of Maori life at that time. The modern Maori complain that the best of the finds from their culture were taken from them and are scattered in the museums around the world, which may be true, but we were suspicious that little of it was ancient then but instead were contemporary items of the time. 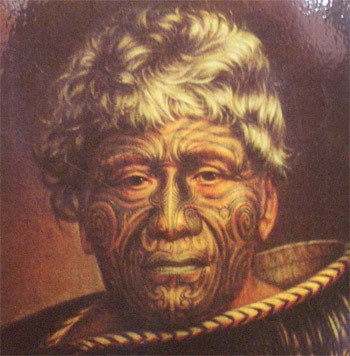 Maori facial tattooing captured in early photos & paintings. Along with being curious about the paucity of ancient artifacts, we quickly tired of the frequently told story of the Maori beginnings in New Zealand. From our very first visit to our first museum and many times since, we heard the Maori story about their ancestor's first landing boat on New Zealand, but it was all myth. It was a myth created by the Europeans from various tribal lineage stories. The Maoris' at the time liked the manufactured story better than their own and embraced it. It was a creation myth that was taught to all in the schools and that many New Zealanders still take as fact. But our books were clear: it's all misinformation repackaged over and over again. Never before in learning about a culture had we been challenged to do so much sorting between the little-known but well substantiated facts and the happily perpetuated myths. At least in places like Greece, the mythology is well labeled as such. Though the Maori are winning compensation battles to correct the injustices of the European land grabs and they are working hard to instill a pride in their past in their youth, all the fuss to recapture their culture seemed to lack heart to us. Though they and the curators tried hard in the museums, we didn't get a sense of reverence or deep ties to the past, it all seems a bit manufactured. But perhaps it is a cultural difference that makes it un-sensed to us. Perhaps it is because we are from a more "object" oriented society and are more prone to anchor and judge things by what we can hold in our hand; perhaps what the Maoris' grieve is the loss of what cannot be seen. But if that's the case, it is oddly juxtaposed with their lack of generosity towards visitors that many other traditional but trampled cultures manage to retain. We were left with more questions than answers to the deeper question of "The Maori" and their place in modern New Zealand as we left Rotorua Questions that would be grist for the mill as we talked and biked and looked for more clues in other places to solve the mystery. Even a look at a tiny map of New Zealand's North Island will reveal Lake Taupo as the most prominent inland feature, an enormous crater lake roughly in the middle of the island. The last big volcanic eruption from Taupo was about 180 ce--big enough that it was recorded by Roman historians. Taupo's big eruption was mostly of ash and pumice, like the ones at Yellowstone National Park and in the John Day area of Oregon. We were excited to be going there--to visit this enormous relic of volcanic history. Sunken & sizzling earth at the Crater's of the Moon site. Bill commented as we approached Lake Taupo that water filled craters weren't as rare as he thought, since Taupo was one of several in New Zealand. Growing up seeing Oregon's stunning Crater Lake made us think that ours was unique, not just 1 example of many. But after seeing a couple of New Zealand crater lakes, Oregon's still is at the top of our list for eye-appeal and "wow" factor. At Oregon's Crater Lake, you can stand on the edge of the crumbly rim made of volcanic matter and look down at both the inside and outside of the crater and immediately make sense of what you see. Seeing the beautiful blue water with its small island adds to the sense of drama of it all. But the crater lakes at Taupo and Rotorua are so big and their banks so green with foliage that their distinctive history has to be imagined. You have to be told that they are volcanic craters and not just ordinary (thought very large) low spots filled with water. Taupo was to be an overnight stay but we scheduled 2 nights, leaving time to walk about 8 miles on the planned layover day as training for our upcoming Tongariro Crossing. The Crossing would be closer to 12 miles over more rugged terrain and with more elevation gain, but we welcomed the opportunity to redirect the conditioning of our legs from pedaling to walking. 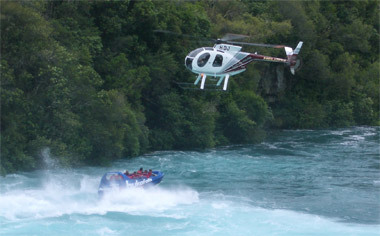 Jet boat & chopper showing off at Huka Falls. The walk along the Waikato River offered views of the much touted (but not so grand) Huka Falls, the intensely blue river water, and a taste of being in dense pine and fern tree forests. We were disappointed that the associated Volcanic Activity Center was closed for the day, but enjoyed the detour on a side road to the Craters of the Moon thermal park. Its place in history is that though it wasn't created as a tourist sight, it emerged spontaneously in 1958 after the nearby plant geothermally generating electricity began sucking hot water out of the ground. Subterranean water levels dropped, decreasing the pressure and killing the nearby by tourist venue geysers, but the remaining underground water got steamier and created fumaroles and mud pots in a new area. Refreshingly, sightseeing activities in Taupo were in the $5-10NZ range--much lower than Rotorua's price point. The tourist info folks in Taupo must hear the complaints of tourists feeling like they are bleeding money in the area as they had a free flyer listing family activities available for under $60NZ . Taupo isn't a hot bed for Maori cultural or spa activities as its early tourism came from trout fishing. Trout and deer were introduced into New Zealand in the 1860's for the purpose of promoting tourism. And trout fishing is still a huge drawing card in Taupo. The local newspaper even reports on which fishing lures have been getting the best catches in the last week. 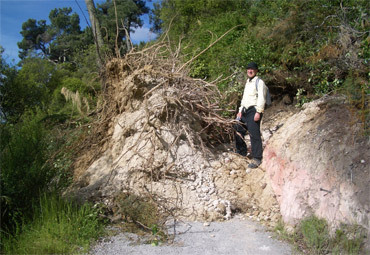 A minutes or hours-old landslide on our Taupo path. Like Rotorua, the adrenaline sport activities are the new pull for the tourist dollar in much smaller Taupo. One of the town's 2 climbing walls was on our way to the river walk, as was the bungee jumping center. Though we settled for just walking in Taupo, we unexpectedly got a taste of the local sport's jolt as we were reviewing the geological story of the Huka Falls. A jet boat filled with a dozen people pulled up to the base of the falls and did a quick 360° turn while a photographer hung out of the low flying helicopter following it. The jet boat maneuver looked like a short-lived thrill and a little crazy but the really dangerous antics seemed to be coming from the helicopter jockeying around for photos. Our long walk itself was quite tame in comparison though we realized it could have had a different ending as a huge pine tree crashed down on our trail sometime after we passed by it for the first time in the morning. It just reinforced for us that we'll save our adrenaline rushes for the unexpected ones in real life rather than pay for manufactured events. While in Rotorua we learned more of the "how it came to be" story about the country's still conspicuous bird population. New Zealand's bird story goes back to when it broke off from the super-continent Gondwana about 85 million years ago--probably before land mammals touched its soil. The lack of prevailing land mammals and snakes literally made it a bird haven and the feathered ones flourished like nowhere else. In contrast, Europe was doomed to being left out of the exotic bird drama. It lacked the unusual physical isolation of New Zealand and it had the Ice Ages, which didn't occur in the Southern Hemisphere (though they had glaciers). Tens of thousands of years of the comings and goings of Ice Ages on the European continent and in Britain meant there was a periodic 'wiping the slate clean' of all species, including birds. When the last Ice Age began withering 15,000 years ago in Europe, the reviving ecosystem bird niches were filled by widely spread Eurasian species--all distinctly modern and well-adapted to predators. New Zealand's birds were thought to have come from Asia but now Australia is considered the incubator for Southern Hemisphere birds and that New Zealand was on the fringe of that major center of bird evolution. The 5 major groups of birds that arose in the Southern Hemisphere 25 million years ago and then spread include: grebes, ducks, pigeons, parrots, and passerines. 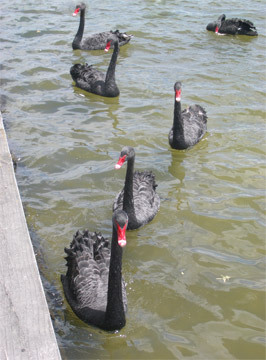 Birds came from Australia to New Zealand in distinctive waves which resulted in bird pairs of similar species. These are pairs of similar but different birds in which 1 of the pair is usually larger or darker than the other. These pairs reflect what are now understood as "double invasions" with the first invasions coming to New Zealand in the pre-mammalian era. These first birds evolved into distinct species in an environment without predators, so tended to get larger and tended to evolve towards flightless, as flight is very energy inefficient. It's not known why, but these early New Zealand species also evolved towards darker and drabber colors, which we've noticed in the many kinds of black birds we've seen. The rate of reproduction also slowed in these early species because of the decreased pressure from predators. The later invaders from the second half of these bird pairs probably originated from Australia also. The new batch in this second wave had the same ancient ancestors as those already in New Zealand but were more similar to their common ancient ancestors than the New Zealand species, as the predators in the original environment kept the more common pressures on the species. Evolving Australian birds had to dodge predator mammals and snakes from the beginning, something the New Zealander birds were spared. So, the late arriving species were all more mainstream in appearance and features. 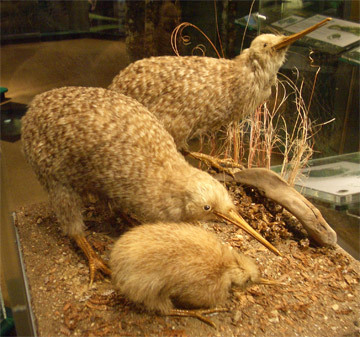 Examples of some of these pairings are: Black Stilts and Pied Stilts; and the New Zealand Robin and the New Zealand Tomtit; and the extinct giant Moas and endangered smaller Kiwis. It's estimated that New Zealand had about 120 endemic or unique species of birds. About a third of them were wiped out by the Polynesians before the Europeans arrived, especially the giant species. 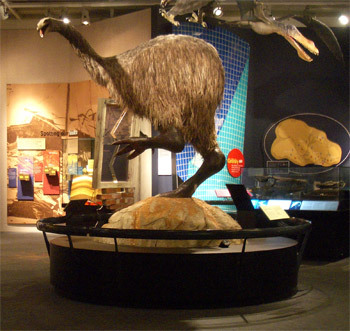 The arrival of the Europeans drove the extinction rate up to about 40%, with species like the kiwis still being threatened. Birds in Australia were living in company with Aborigines for 60,000 years, so the arrival of the Europeans 200 years ago there didn't make much of a ripple, whereas the birds in New Zealand didn't contend with human settlements until the 13 century. The much smaller flightless kiwis have survived. The accelerated rate of extinction of bird species in New Zealand was affected directly and indirectly by humans. The direct threats were hunting; introduction of diseases and predators; and habitat destruction. But a more subtle factor behind some extinctions was the slowing of the reproductive rate of the birds which occurred over thousands and millions of years--a slowing that occurred because of the lack of pressure on their populations. When the species came under threat by people appearing on the scene, the oldest species weren't able to rebuild their numbers as fast as their late-arriving counterparts that reproduced more quickly. Our visit to Rotorua left us with more questions than answers about the Maori, but as least the story about the birds was getting clearer. We are plugging away along the northern coast of the South Island of New Zealand, having landed in Picton by ferry from Wellington about a week ago. We are slowly working our way west, doing some hiking in this highly rated "tramping" region. At the end of the week we'll be heading south towards Nelson Lakes and then west to Westport on coast.